There is no doubt that choosing a beautiful Winter Wedding is the cheaper option, with potential money to be saved on wedding venue hire and also guest accommodation, honeymoon bookings out of peak season, and the potential to exploit decorations already in place in your chosen wedding venue around the Christmas festive season! Quite possibly you have dreamed of a romantic winter wedding full of snow, but if you live in many areas of the world, you know that no matter what date in the winter you schedule your wedding for, Mother Nature cannot guarantee that it will be a white wedding. However, there are many places in the world in which you can travel to for a snow filled winter wedding day. Destination weddings aren’t only reserved for tropical locations and warmer climates – you could have a destination winter wedding too. If you would like to say within Europe, there are plenty of ski and snow resort destinations and lodges. Most of them have wedding packages, group rates for your guests, and can “guarantee” snow for your big wedding day – even if it is man-made. Imagine how fun and romantic it could be to have your wedding reception in a log cabin setting, or in a luxurious French Castle with a roaring fire going, sipping French champagne, red wine or hot apple cider. After your romantic wedding your guests can enjoy skiing, snow tubing, snowboarding, ice skating or sleigh riding. Castle weddings and château weddings are becoming more and more popular – both spring weddings, summer weddings, autumn weddings and winter weddings. Now a days brides and grooms want to create their own individual wedding or unusual wedding. You can look for resorts in countries such Norway, Sweden, Poland, Hungary, Italy and France which is one of the preferred wedding destination, partly because of the magnificent French cuisine. Here you will find beautiful Castles to get married in – often they have their own church where the priest conduct the religious ceremony. Winter weddings can be elegant and a spectacle that can bring you on a high note into the thoughts of spring. There are snow covered trees and beautiful scenery that can be incorporated into the winter wedding pictures, which can compliment one of the most important parts of the wedding – the stunning wedding dress and the wedding bouquet. 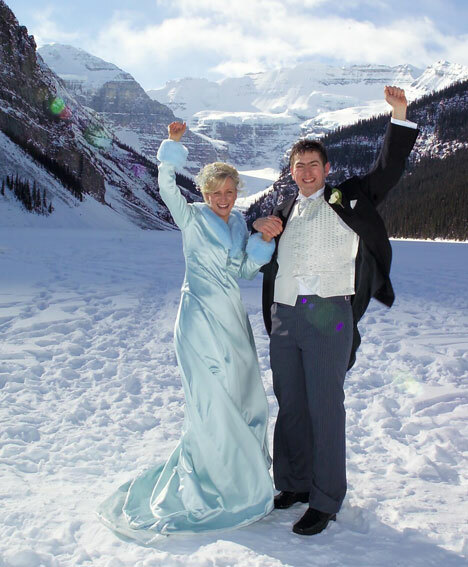 Unique winter weddings also allow for the opportunity to be a bit different for both the bride and groom, on aspects like unique wedding dresses and wedding reception ideas. Cold weather means romantic log fires in a English Castle or a French Castle, warming up in four poster beds and such like!! You will love it. Choosing fabulous winter wedding dresses does not have to be difficult. Usually, a thicker and luxurious wedding fabric will be used to create the dress, as opposed to the airy and light fabrics that are used through summer weddings. Velvet is a favourite fabric of designers wishing to create a winter wedding dress that can bring attention to the bride to be on her wedding day. There are also many unique wedding accessories that can be chosen to complement the magnificent winter wedding dresses that are chosen through the wedding ceremony. Luxurious wedding shoes and fur lined capes can be used to keep warm throughout the cold season and allow you to have a luxurious and fairy tale-feel to the wedding pictures. When choosing a winter wedding dress, keep in mind the following aspects – the winter wedding dress should convey the theme of the wedding and keep with the season. Therefore, luxurious trimmings and embellishments are a great way to create unique features within your winter wedding dress. Of course, if you are planning a luxury winter wedding near or far, do not forget to give your guests a winter wedding favor to commemorate your beautiful winter wedding. Some great ideas are snowflake bottle openers, snow globes, hot coca packets, picture frames, or crystal glasses or other crystal items. These will all be appreciated by your guests to remember such a wonderful wedding event.